This photo gallery is comprised of pictures taken at the annual conference throughout the years. Many of these photos come from the photo albums that Judy Palenske and others have taken as part of the History Committee. KAM members, we invite you to click the Upload link and add your own memories to the gallery! This certainly looks like trouble waiting to happen! Why does Ken Nelson from DASC look so sad? Only the photographer and the DASC crew know for sure. Seiler- Scott Smith and ? I hear we have a really good grand prize this year!!!! We learn alot at conferences but we also have fun with our fellow professionals. 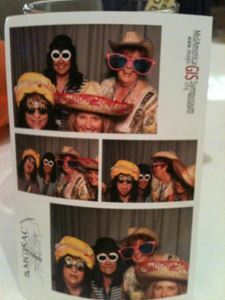 Here's some KAM members who are enjoying the photo booth on Exhibitor night at the 2012 MAGIC conference.